It’s been over a decade (yes…a decade) since I wrote one of my most commented upon posts ever (ah, those were the days) titled A Steep Unlearning Curve. One of the nice things about having 15+ years of thinking and reflecting archived online is being able to go back and see how things have, or haven’t changed. In this case, it’s feeling like the latter. To be blunt, in the 10 years since posting, none of the things on my list of “10 Things We Need to Unlearn” have we actually unlearned. In fact, I’m hard pressed to argue that we’ve even made inroads on any of them. That said, is anyone surprised? I’m just wondering what my LinkedIn friends would say is the most profound UNlearning that needs to happen in education. The MOST challenging. The one that would make people MOST uncomfortable. Let me first say that LinkedIn is not a place that I spend much time. So, it’s not like I was expecting much in response. Almost 30,000 views, 95 likes, 131 comments…and counting. Needless to say, I was kinda blown away. As you can probably guess, the comments tracked my own Top 10 list from 10 years ago pretty closely. I had a bit of time in transit yesterday to go through all of them and put them into some general buckets of things readers thought we need to unlearn. Not surprisingly, standardized assessments and assessments in general came in first. Credits and grades came in second. But somewhat surprisingly to me, “teacher centered pedagogy” came in a close third, mentioned about 10% of the time in some form. If you’ve got a LinkedIn account, you can read them all if you like. Famously now, Alvin Toffler wrote “The illiterate of the 21st century will not be those who cannot read and write, but those who cannot learn, unlearn, and relearn.” That written in the last decade of the 20th Century that, from an education standpoint, still looks fairly familiar. No doubt, we educators have learned through personal experience what constitutes an education, and we have learned as participants the “best path” to getting one. 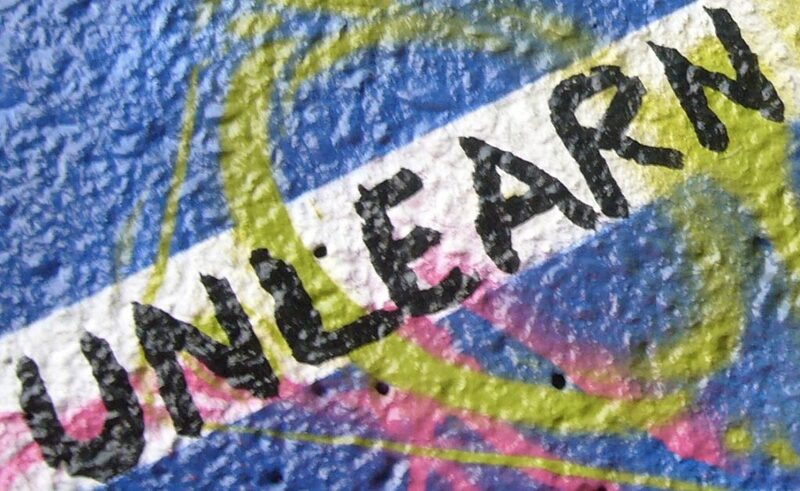 We can repeat the “unlearn and relearn” part of that quote a million times, but if we don’t have and live through enough of a modern lens on the world to create a sufficient sense of urgency, we’ll be resting on what we’ve “learned” for a long while to come. That said, I refuse to unlearn the belief that we really can unlearn the traditional systems and narratives of school despite the extraordinarily deep roots that currently sustain them. To do so would be to give up on the millions of kids who will remain in public schools after those with the means to do so opt out into more creative, dynamic, progressive, curious alternatives, the ones built from the ground up in response to a deep frustration for the status quo and a palpable urgency around the need for modern learning experiences and environments for kids.